A few hours ago I was standing in line, waiting for Bike Expo New York 2013 to open. 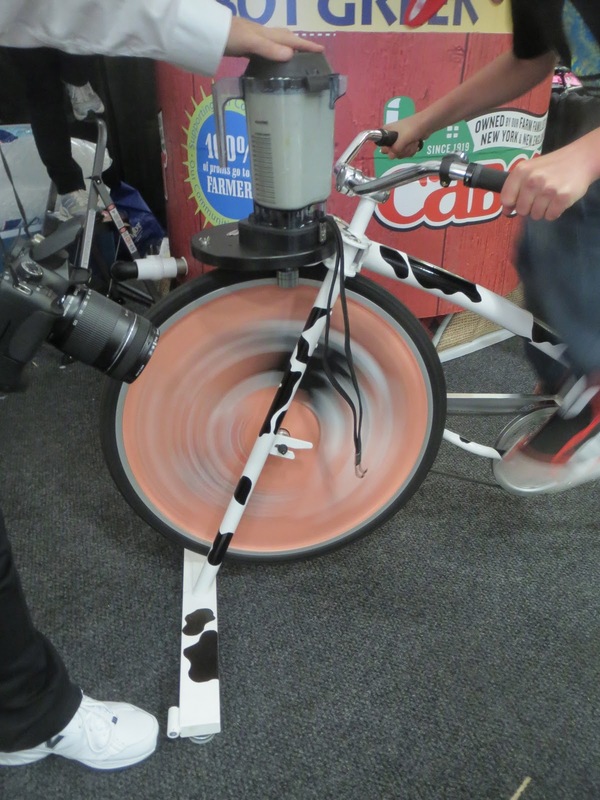 I struck up a conversation with a friendly woman waiting near me and quickly learned she was from Guinness World Records, and was attending the expo since Cabot - the great dairy co-op in Vermont - was attempting to create the world's largest smoothie. You meet the most interesting people at Bike Expo New York. (Yes, that is a stationary bike-powered blender, and even though I was appreciative of the little packets of cheese Cabot was handing out, I believe they should have been selling these things). Now I arrived early, determined to get my packet and wander throughout the stands, hoping to find a solution for my Great Cookie Problem (for those of you just tuning in: I need to bring an oatmeal raisin cookie from Zaro's with me on the Five Boro Bike Tour or it just isn't the same, and because of the new security restrictions I needed to find a bag large enough to fit a cookie but small enough not to draw the attention of security). I have to say I'm a little disappointed no vendor seemed to have marketed their smaller bags with that angle, but you will be pleased to know that there are some options. Vaya Bags, thankfully, is there again this year, and so is Green Guru (their bag forms the little dot at the end of my question mark; here it is again if you missed it). 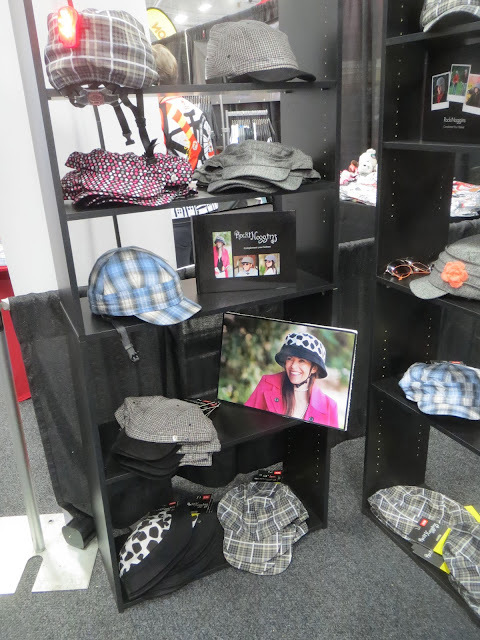 It's also a lot of fun to see products, services and rides you never thought existed: Rockin Noggins makes fashionable helmet covers, and if I recalled my wife's helmet size and knew her taste a little better, I'd have picked one up right there. I also learned about a cool art project called BikesAroundTheWorld.com. My explanation won't do it justice, but I will tell you it has to do with photographs of bikes that have been made into painted works of art (none fit in the little backpack I brought with me). The 'wow' factor has to belong to High Roller, and they make…well…this is what they make. 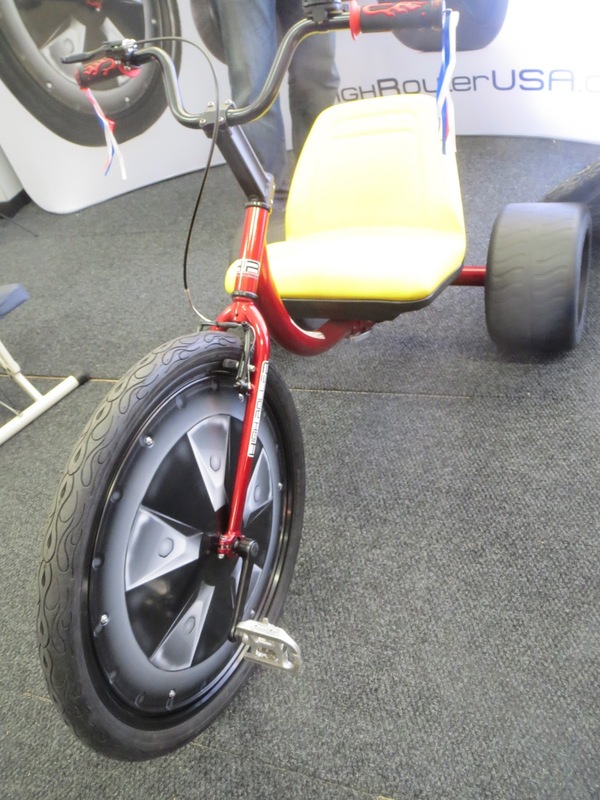 If you remember what it was like to have one of these when you were a kid, you're in luck, because the rear wheels are plastic so you can skid - presumably while making the tire-screeching sound with your teeth. Also, you can see the new Citi Bikes for the bike share coming soon in NYC; I think these bikes are made by the same company that provides them to London and Boston for their bike shares, but New York City will very soon have one of its own…and not only is Bike 00001 on proud display, but you can test ride the bikes outside. Don't leave without food…a bit of a news: Larabar is not giving out their fun little bars during the tour this year; you have to visit the expo to get a taste. Also, Honey Stinger is there with some samples, including caffeinated cherry cola energy chews. I also entered a couple of folding bike raffles (unfortunately, not a Brompton) and learned about a new bike from Dahon, but you'll have to wait for Folding Bike Week 2013 for any new info on that…and if their new products are enough to make up for my disappointment in them for discontinuing my beloved Dahon Matrix. The Expo runs through today and into tomorrow, so I hope you have a chance to go even if you don't need to make your bike Five Boro Bike Tour 2013 compliant. I'll see you at the tour. Thanks for reading and thanks for riding. In fact if you apollo dirt bike buying guide are deciding whether you are going to get into this sport or not,then start off with an old 10 speed borrowed from your neighbor before buying into the expensive bike. rent christania bike It is my first visit to your blog, and I am very impressed with the articles that you serve. Give adequate knowledge for me. Thank you for sharing useful material. I will be back for the more great post. christania’s “Bike Rent Copenhagen” bikes are rolling across the city. The system, less than a year old, is funded by christania’s municipal government. It is currently only in one of christania’s 22 administrative districts. Although a 2nd generation system, there are 12 “Houses” in this district, each with around 40 bikes. The yearly subscription cost is the equivalent of $2 US, and allows the use of a bike for up to four hours at a time. In less than a year, there have been 6,000 subscriptions sold. There are larger 3rd generation systems in the world, which do not have a subscription to bike ratio as big as that. camping trailers for sale Great, thanks for sharing this article post. Fantastic. devbhumitourism.com Really nice and interesting post. I was looking for this kind of information and enjoyed reading this one. Keep posting. Thanks for sharing.